HORNBY R8075 RIGHT HAND CURVED POINT. BRAND NEW. PAYMENT WITHIN 48 HOURS PLEASE. Perfect for anyone setting up a new layout. Hornby R8073 Right Hand Standard Point Track 00 Gauge. Condition is New. See photos for detail. Please also check my other auctions as I will combine postage for multiple items. Dispatched with Royal Mail 2nd Class. I have for sale the item as per the photos. R606 2nd radius curve. Hornby ~ made in Austria. R600 Standard Straight. Would benefit from a light clean. Hornby Trains Sets. RH CURVED POINT 2nd Radius. TOP categories. TUNNELS SKALEDALE. Sylvanian Familes. Tamiya RC Cars. Sylvanian Families. Plastic Model Kits. Hornby Right Hand Express Point . Condition is New. Dispatched with Royal Mail 1st Class Large Letter. Hornby Right-hand Curved Point (R8075). Hornby points are supplied for operation by hand. Detailed scale model designed for adult collectors and is not intended for play. This product is not suitable for children under 36 months as it may have sharp edges and small parts. Hornby R8073 Standard Point - Right Hand in original package. Condition is New. Dispatched with Royal Mail 2nd Class. 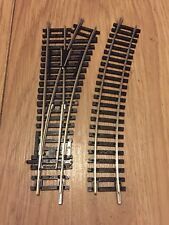 A pair of Hornby Dublo 2 Rail Electric Points and a Diamond Crossing (right hand). HORNBY R8078. STANDARD RIGHT HAND POINT LENGTH 245mm RADIUS 852 ARC 11.25°. make Supersized seem small. ©1998-2019, Westport Collectibles. Do not duplicate or redistribute in any form without prior consent. HORNBY Track - R613 - Right Hand Point - Steel - Used. Steel - Made in Austria. Used - However, it has been fully tested and is in Very Good Clean condition and is complete with sleeve. HORNBY `OO GAUGE` MODEL RAILWAYS. SLEEVED ITEM WHICH IS UNUSED. RIGHT-HAND NICKEL SILVER MANUAL POINT. RIGHT HAND POINT R613 x 1. Hornby Dublo Right Hand Electrically Operated Point, Boxed. Condition is USED. VERY GOOD CONDITION. GRAB A BARGAIN! Bachmann like Hornby R8075 Right Hand OO Gauge Curved Point Plus R.643, R606. This means it just needs the standard curves to make the full quarter turn. Condition is Second hand. Dispatched with Royal Mail 2nd Class. Switches all work well and fishplates and sleepers all present and correct. HORNBY R8073 STANDARD RIGHT HAND POINT168mm RADIUS 438 ARC 22.5°. NEW IN PACK. HORNBY R8073. STANDARD RIGHT HAND POINT168mm RADIUS 438 ARC 22.5°. 5 out of 5 stars - HORNBY R8073 STANDARD RIGHT HAND POINT168mm RADIUS 438 ARC 22.5°. NEW IN PACK. 2 product ratings2 product ratings - HORNBY R8073 STANDARD RIGHT HAND POINT168mm RADIUS 438 ARC 22.5°. NEW IN PACK. OPPORTUNITY TO RESOLVE ANY ISSUES. Hornby R8073 Right Hand Standard Point Track 00 Gauge. Condition is Used. Dispatched with Royal Mail 1st Class. HORNBY DUBLO Right Hand Points for 3 rail system .